It is said that the Scottish flag, also known as the Saltire or St. Andrew's Cross, has its origins in the ninth century, when a battle between English and Scottish soldiers ended up with the victory of the Scottish’s through the divine intervention of San Andrés. This saint had been a disciple of Christ. The Romans crucified him on a cross-shaped X, and the legend tells that the blade shape appeared to them, the Scots, during the battle to win English. However, it was not really until the late fourteenth century when the Scottish Parliament stated that soldiers must carry 'saltire' as distinctive. This badge becomes a national symbol during the sixteenth century, when it acquires the blue background (previously it had been red). He went through different shades until the country's government decided in 2003 to standardize the cobalt blue. Prior to this, the ensign that prevailed was that of the Kingdom of Scotland, which consisted of a gold coloured background on which was drawn a red lion rampant, with blue nails and tongue, and surrounded by a double flowered frame. It is not clear why the colours of the flag of Scotland were those and no others. Some attribute them to the St. Andrew’s image formed in the sky during the battle between the English and Scots, when over the blue sky a cross on X with white cloud was formed. 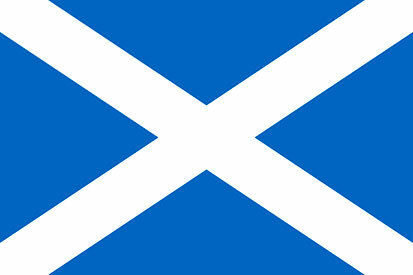 Average rating Flag Scotland: 5 arround 5 stars. xabier made his purchase on 20/10/2017. vicente made his purchase on 14/10/2016.